Note that this event will also be streamed live on the web. 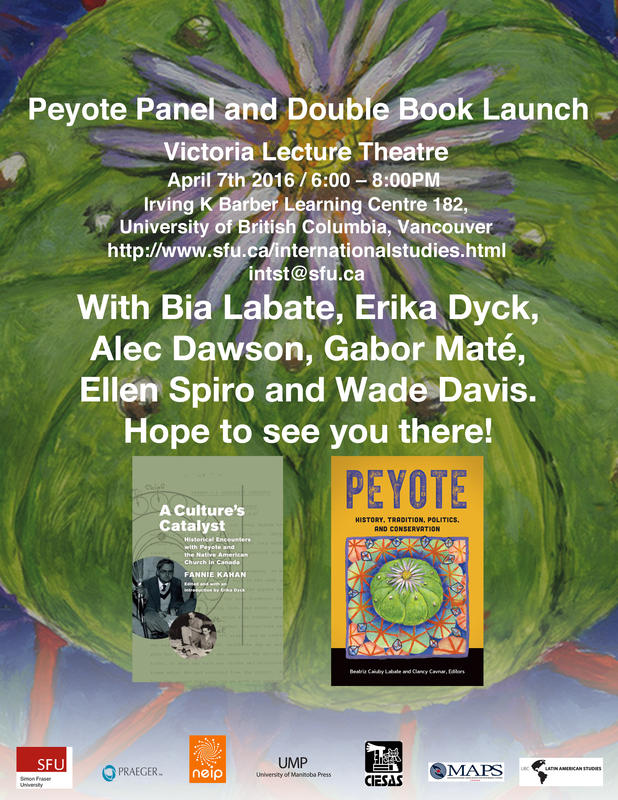 Simply go to http://www.ikebarberlearningcentre.ubc.ca/peyote-panel-and-double-book-launch/ at any time after 5:45pm. Complex unconscious psychological stresses underlie and contribute to all chronic medical conditions, from cancer to addiction, from depression to multiple sclerosis. Therapy that is assisted by psychedelics, such as ayahuasca or peyote, in the right context and with the right support, can bring these dynamics to the surface and thus help a person liberate themselves from their influence. This presentation will give special focus on my experience in treating addictions and other stress-related conditions, both with aboriginal people and in non-indigenous contemporary healing circles. It will also reflect on the current popularity of psychedelics and the challenges associated to the expansion of its use. Fannie Kahan, A Culture’s Catalyst: Historical Encounters with Peyote and the Native American Church in Canada, Edited by Erica Dyck. (University of Manitoba Press, 2016). In 1956, pioneering psychedelic researchers Abram Hoffer and Humphry Osmond were invited to join members of the Red Pheasant First Nation near North Battleford, Saskatchewan, to participate in a peyote ceremony hosted by the Native American Church of Canada. Inspired by their experience, they wrote a series of essays explaining and defending the consumption of peyote and the practice of peyotism. They enlisted the help of Hoffer’s sister, journalist Fannie Kahan, and worked closely with her to document the religious ceremony and write a history of peyote, culminating in a defense of its use as a healing and spiritual agent. Although the text shows its mid-century origins, with dated language and at times uncritical analysis, it advocates for Indigenous legal, political and religious rights and offers important insights into how psychedelic researchers, who were themselves embattled in debates over the value of spirituality in medicine, interpreted the peyote ceremony. Ultimately, they championed peyotism as a spiritual practice that they believed held distinct cultural benefits. A Culture’s Catalyst revives a historical debate. 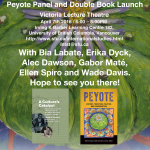 Revisiting it now encourages us to reconsider how peyote has been understood and how its appearance in the 1950s tested Native-newcomer relations and the Canadian government’s attitudes toward Indigenous religious and cultural practices. This book focuses on peyote (Lophophora williamsii), a hallucinogenic cactus containing mescaline, which grows naturally in Mexico and southern Texas. Mescaline is an internationally controlled substance, though exemptions have been made for the religious use of peyote by indigenous groups in Mexico, and by the pan-indigenous Native American Church with chapters in both the United States and Canada. Currently, natural populations of peyote are in decline, due both to improper harvesting techniques (by licensed and non-licensed harvesters) and environmentally damaging economic activities (mining, agriculture, growing cattle, oil developments). In Mexico, peyote is considered a species requiring “special protection” due to environmental concerns; peyote is also protected under the Convention on the International Trade in Endangered Species (CITES) as a species liable to become endangered. This collection addresses the delicate relationship between “the needs of the plant” as a species and “the needs of man” to consume the species for spiritual purposes. The chapters also discuss the history of peyote regulation in the United States and the special “trust responsibility” relationship between the American Indians and the government. Under the argument of “equal protection,” different groups have attempted to obtain an exemption for peyote use. As is the case with conservation, multiple stakeholders’ interests are in conflict. The discussion and comparison of diverse legal cases touch upon concepts such as place, ethnicity, identity, and tradition. The expansion of the peyote traditions is used here as a foundation for examining issues of international human rights law and protections for religious freedom within the current prohibitionist system and global milieu of cultural transnationalism. Collectively, this book offers a unique contribution by presenting a dense anthropological description of peyote use in different contexts, and addressing con-temporary conservation and legal issues surrounding peyote and its religious use. Wade Davis is Professor of Anthropology and the BC Leadership Chair in Cultures and Ecosystems at Risk at the University of British Columbia. Between 1999 and 2013 he served as Explorer-in-Residence at the National Geographic Society and is currently a member of the NGS Explorers Council. Author of 19 books, including The Serpent and the Rainbow, One River, The Wayfinders and The Sacred Headwaters, he holds degrees in Anthropology and Biology and received his PhD in Ethnobotany, all from Harvard University. His many film credits include Light at the Edge of the World, an eight-hour documentary series written and produced for the National Geo-graphic. Davis is the recipient of 11 honorary degrees, as well as the 2009 Gold Medal from the Royal Canadian Geographical Society for his contributions to Anthropology and conservation, the 2011 Explorers Medal, the highest award of the Explorers Club, the 2012 David Fairchild Medal for botanical exploration, the 2013 Ness Medal for geography education from the Royal Geographical Society and the 2015 Centennial Medal of the Graduate School of Arts and Sciences, Harvard University. His latest book, Into the Silence, received the 2012 Samuel Johnson prize, the top award for literary nonfiction in the English language. In 2016 he was made a Member of the Order of Canada. Alec Dawson is a scholar of Modern Mexico, and Professor of History at Simon Fraser University in Burnaby, British Colombia, Canada. He is currently working on a book titled Peyote Wars, which examines the ways peyote, whiteness, and indigeneity have been linked over time in Mexico and the United States by indigenous peoples, ecclesiastical authorities, government officials, and others. He is the author of Latin America Since Independence: A History with Primary Sources, 2nd Edition (Routledge, 2014), First World Dreams: Mexico Since 1989 (Zed Books, 2006), and Indian and Nation in Revolutionary Mexico (University of Arizona Press, 2004). Erika Dyck is a Professor of History and a Canada Research Chair in Medical History at the University of Saskatchewan in Saskatoon, Canada. She is the author of Psychedelic Psychiatry: LSD from Clinic to Campus (Johns Hopkins University Press, 2008); Facing Eugenics: Reproduction, Sterilization and the Politics of Choice (University of Toronto Press, 2013), which was short listed for the Canadian Historical Association’s prize for the best non-fiction book in history 2013; and several articles and book chapters. Her research interests have focused on the history of madness and psychiatry, which led to her book on LSD experiments in western Canada. Her work has since examined the history of sexual sterilization, particularly for people entangled in the mental health system. Her new projects involve a collaborative historical study of the Weyburn Mental Hospital, the last asylum built in the British Commonwealth and the site where the word psychedelic was coined. The other is a co-authored study with Maureen Lux that compares reproductive rights in the 1970s in Canada across four categories: Aboriginal women living in northern Canada; middle-class men seeking vasectomies; teen-age girls; and dependent adults, due to disability or mental illness. Gabor Maté is a Canadian physician, speaker and the author of four bestselling books published in nearly twenty languages on five continents. His interests include the mind/body unity as manifested in health and illness, the effects of early childhood experiences in shaping brain and personality, the traumatic basis of addictions, and the attachment requirements for healthy child development. He has worked in family practice and palliative care, and for twelve years he worked in Vancouver’s Downtown Eastside, notorious as North America’s most concentrated area of drug use. Currently, he is adjunct professor in the department of criminology, Simon Fraser University, and teaches and leads seminars internationally. For more information, see: www.drgabormate.com. Ellen Spiro is a Professor of Radio-TV-Film at the University of Texas in Austin and a boundary-pushing documentary filmmaker. Her work champions mavericks and renegades with wit, delight, and emotional depth. Her documentaries include Diana’s Hair Ego, Greetings From Out Here, Roam Sweet Home, Atomic Ed & the Black Hole, Are the Kids Alright?, Troop 15OO, Fixing the Future and, co-directed with Phil Donahue, Body of War, shortlisted for an Academy Award. Emerging as a visual artist during post graduate work within the Whitney Museum Independent Study Pro-gram, Spiro’s films are today found in permanent collections of the Museum of Modern Art in New York, the Academy of Motion Picture Arts and Sciences, UCLA Film and Television Archive, the Peabody Collection of The Paley Center for Media, and the New York Public Library. She has been awarded fellowships from Guggenheim, Rockefeller and National Endowment for the Arts. She also has won two Gracie Awards for Outstanding Director and Outstanding Documentary for Troop 1500, from the Foundation of American Women in Radio and Television. Spiro studied at the University of Virginia, and earned her Master’s Degree in Media Studies at SUNY Buffalo. Her films have been broadcast and premiered in prestigious film festivals around the world.